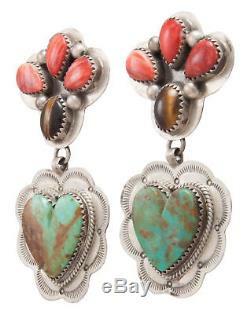 Navajo Native American Turquoise Heart Earrings with Tiger Eye SKU#231333. 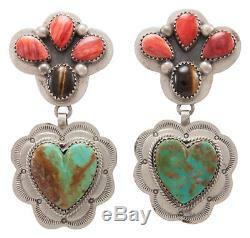 This is a pair of Navajo handcrafted earrings by Dorothy Ashley. These heart inspired earrings are created with Kingman Turquoise, Spiny Oyster Shell and Tiger Eye crafted with Sterling Silver. Both settings are signed by Dorothy noted as D Ashley and are stamped Sterling. 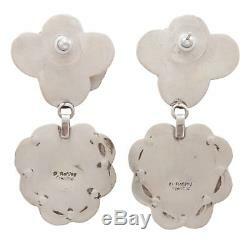 The earrings measure approximately 2 1/2 inches top to bottom and are 1 1/4 inch wide at the widest point. Total weight of the pair is 25.5 grams. You will receive the exact item pictured. We have taken pictures of this specific, individual item which is the exact item you will receive. A Certificate of Retail Value is available upon request. We specialize in enjoying the artistry and skill of all things Southwest. From Native American Indian jewelry to kachinas and pottery, we continually seek to find items that we enjoy and we hope that you enjoy them too. Shortly thereafter we discovered that there was a great deal of passion for Native American artistry and we began getting requests for many other sorts of jewelry. We now carry many different items, and are constantly looking to grow our store to include more and more wonderful items. Thank you for visiting us! We are nothing without the skill and artistry that each of our passionate artists brings with them to each item. We also understand that you bring a similar passion and appreciation for each of these pieces. That is why we strive to provide only the highest quality artistry on our site. We also offer a 100% guarantee for each of our items. We understand that shopping on-line can be difficult. Pictures never do justice to the items true beauty, and colors can vary between different computer monitors. With our 100% satisfaction guarantee, you can shop with confidence knowing that you will never be stuck owning an item that you do not enjoy completely. We will be adding extra features and new product lines regularly, so come back often! We stand behind everything we sell! If the item is damaged, we will make every effort to replace it. Be sure to include any relevant information that will help us locate your order i. Place your item for return back into its box and or other packaging.. You can use the same mailer envelope that was used to send the item to you. Simply put the return item back into the envelope and seal it with tape. Please include a copy of the order with the return as well. This helps us to identify the piece once we receive your return. Our goal is to make your shopping experience exciting, fun, and easy to understand. Powered by Solid Commerce The All-in-One Listing, Inventory & Order Management Solution. The item "Navajo Native American Turquoise Heart Earrings with Tiger Eye SKU#231333" is in sale since Sunday, October 02, 2016. This item is in the category "Jewelry & Watches\Ethnic, Regional & Tribal\Native American\Earrings". The seller is "turquoisecanyon" and is located in Ashburn, Virginia. This item can be shipped worldwide.